A new option has been added: Mass Receiving. Warehouse receiving records (POWHRECI) are created using passed values from the screen program, values from the PO header file (POORDHDR), and PO line file (POORDLIN). 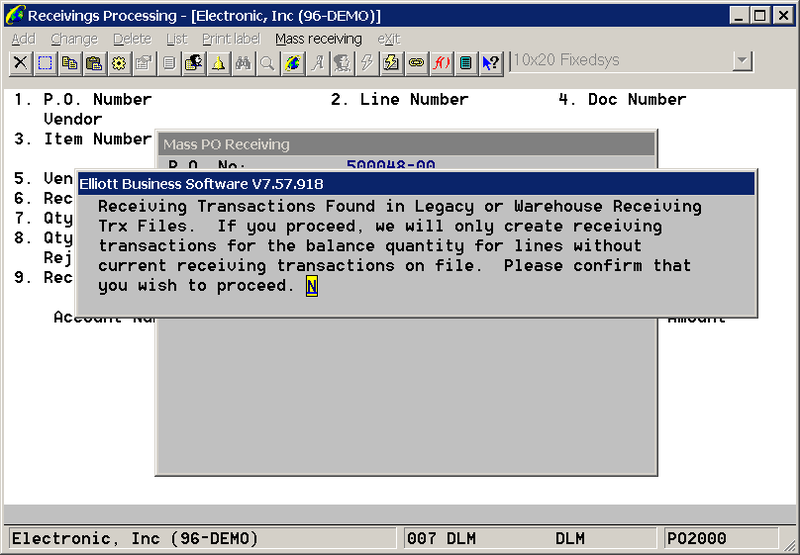 As part of the process to create a warehouse receiving record, the program will update the vessel file (IMVESSEL), close the PO line item record (POORDLIN), update ATP information (IMATPFIL), create a PO invoice header record (POINVHDR) , and then trigger a receipt event. Please review the following items for error or warning situations. 1) When doing a Mass PO receiving, if there are already records in the regular receiving transaction file (POTRXFIL) or the Warehouse Receiving transaction file (POWHRECI), a warning message will be shown and the user will be asked if they want to continue. 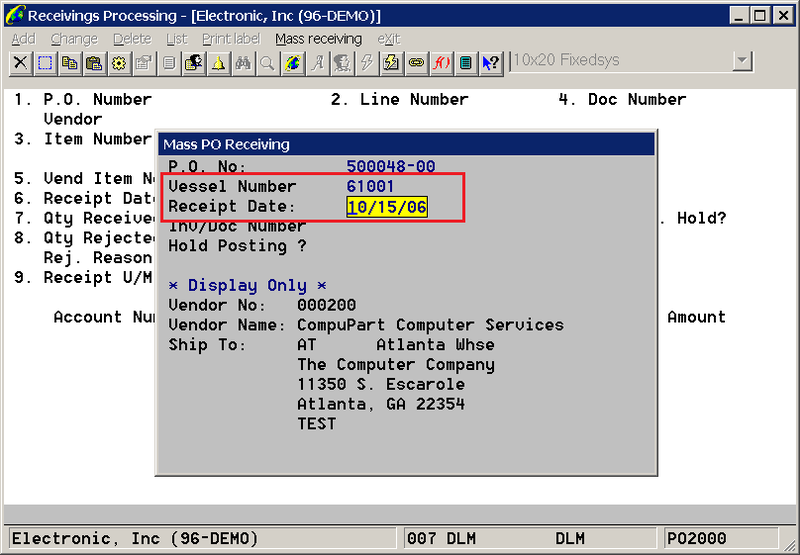 2) Vessel Number is the second field on the Mass PO Receiving screen. 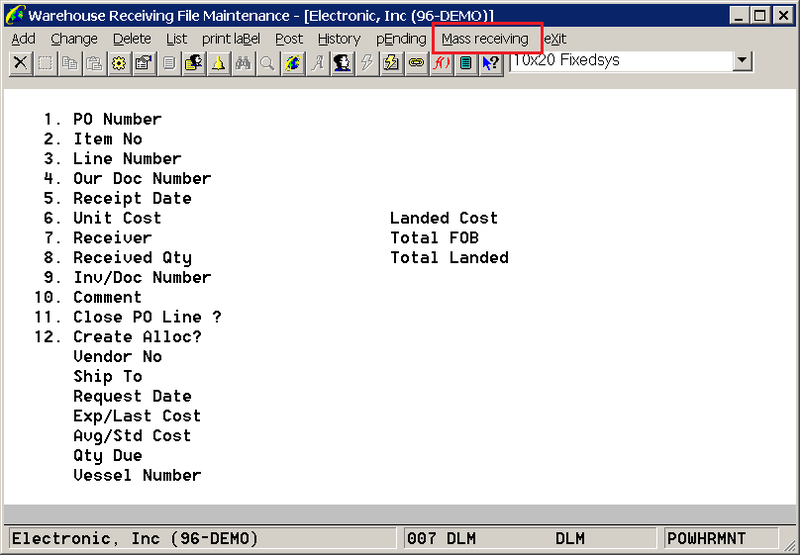 This will allow the receipt date to be populated with a date from the vessel file if vessel number is entered and the vessel exists. 3) The report program will check to make sure Item weight is greater than zero on the item file if Global Setup-> Dist-> PO Warehouse Receiving-> 6. 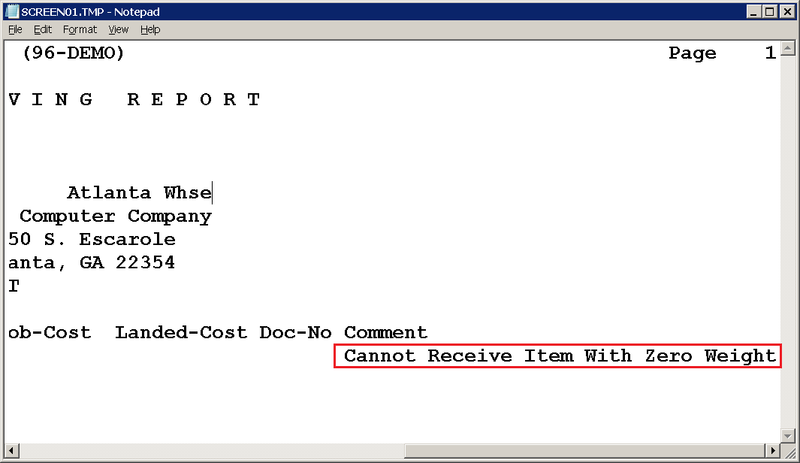 Allow Receiving Item with Zero Weight is set to N. If the item is not eligible to be received, a message will show on the report and the item will not be received. 4) The program will check for any transaction records in the receivings transaction file (POTRXFIL) or the warehouse receiving transaction file (POWHRECI). If records exist, a message will show on the report and zero quantity will be received.